In the 1970s, as I was searching for recordings by George Hamilton Green, I discovered that in virtually every antique shop that had 78 rpm records on its shelves, I could find a few records on which either Green, or his brother Joe, or another xylophonist was playing. 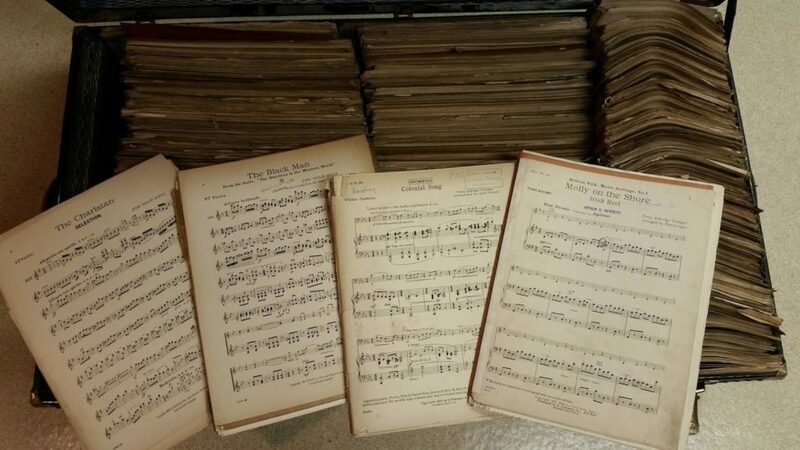 By the early 1980s, after rummaging through numerous antique shops in the eastern United States, I entered one close to home in Rochester and came upon several large cardboard boxes full of sheet music. Out of curiosity I started thumbing through the boxes and soon realized that they contained a variety of music published in the early 20th century – very similar to the music that I had been listening to on my growing xylophone record collection: classical transcriptions, marches, waltzes, popular songs and more. 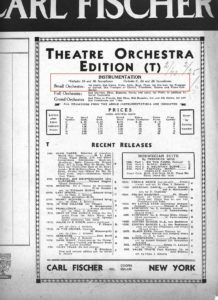 The boxes were all filled with music orchestrated for small (12-piece) orchestra by a number of the major publishing houses and their arrangers. There were hundreds of titles. Much of the music had been stamped with the name either of the orchestra or of the orchestra leader, to whom the music once belonged. In the years immediately preceding 1922 – the year in which the Eastman Theatre opened in Rochester – there were as many as a dozen movie houses downtown – among them the Lyceum, the Cook Opera House, the Bijou Dream, the National, and the Empire – showing silent films accompanied by live orchestras of from 5 to 15 musicians. William G. Street (my percussion teacher when I was a student at the Eastman School of Music in the 1960s) was a percussionist in one of those orchestras, not only playing along in the orchestra, but also catching lots of the acoustic sound effects that enhanced the visual action on the film. When the Eastman Theatre opened with its in-house, 80-piece symphony orchestra to accompany the silent films, the other movie theaters in Rochester weren’t able to compete and one-by-one they closed their doors forever. (Bill Street, mentioned above, was hired at the outset for the new Eastman Theatre Orchestra, the progenitor of the present day Rochester Philharmonic Orchestra, and he soon became the orchestra’s timpanist.) The music libraries of some of the closed movie houses were either purchased or transferred to various local musicians, and by the 1970s, with the contents of the old libraries no longer being appreciated by the public, the collections ended up in the far corners of a few local antique shops, where I was able to stumble upon them by chance. In only a few short years I accumulated a theater orchestra library of hundreds, if not thousands, of arrangements. Composed in 1850, Raymond Overture became a favorite of concert audiences, although the opera itself never quite attained the popularity of Thomas’ most well-known opera, Mignon. While it might normally be expected that Raymond Overture would be performed by a full symphony orchestra, in small towns far removed from the big cities, transcriptions for smaller orchestras, arranged by composers in the major publishing houses, would be performed, enabling audiences everywhere to enjoy their favorite music from the opera. This arrangement by the great American band-master was published in 1915. It’s easy to hear why Fillmore was known as the the foremost advocate of the sliding trombone. In 1921 Al Jolson introduced this song to the American public in the musical comedy, Bombo. This arrangement was published that same year. This music, complete with Indian tom-toms, is typical of the “characteristic” or “novelty” pieces which were frequently used to provide background music for silent films. Such music was highly stylized in order to convey specific moods for silent film audiences. No theater orchestra program would be complete without at least one instrumental solo, and the fantasia was a common format in which to feature an instrumental soloist. By simply taking a popular melody and then recasting it in several variations with each variation becoming faster and more technically challenging, the fantasia became an ideal platform on which to display the virtuosity of the soloist. It was also a common practice for composers/arrangers to include short fragments referencing phrases from the best known patriotic songs. The composer, Edwin Franco Goldman, was the well known founder of the very popular Goldman Band (1918), and the earlier New York Military Band (1911). The Russian Rag is based on the popular piece for piano, Prelude in C# Minor by Sergei Rachmaninoff. 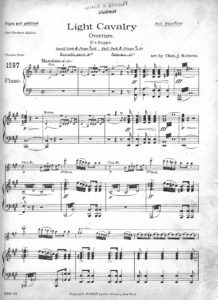 This arrangement was published in 1918, and it became very well known, largely due to recordings. The syncopated ragtime rhythms added an infectious vitality to the music. During the 1920s this version was played in Rochester by the Eastman Theatre Orchestra in a version that featured William G. Street and his brother Stanley Street performing as a xylophone duo accompanied by the orchestra. Titles such as Wizard of the Nile, Jealous Moon, Tulips and Pansys, Echoes of the Opera, Black and White Rag, A Lucky Duck, Dardanella, Little Charmer, My Paradise, and many others were also included in various RTO programs. During the 1980s music from the Rochester Theater Orchestra library was also used in several special patron recognition programs that I created and conducted for the Rochester Philharmonic Orchestra. These special concerts included short silent films from the archive of the George Eastman House at venues such as the Eastman House’s Dryden Theatre, and at the University of Rochester’s Wilson Commons. 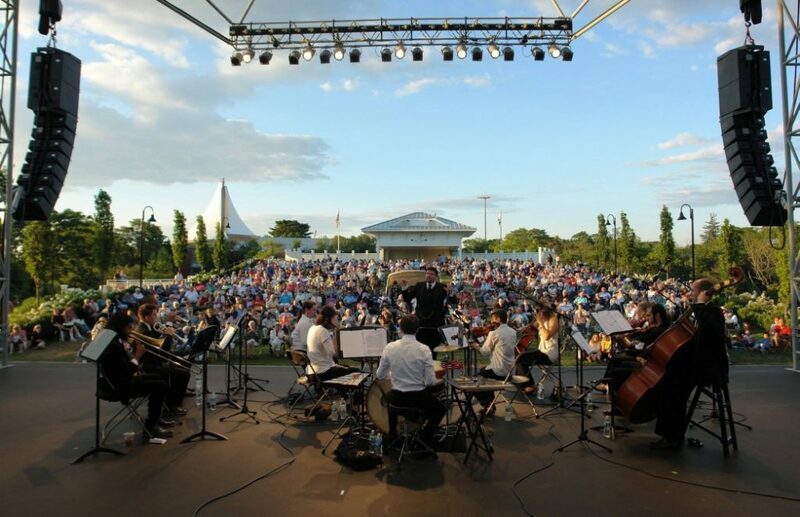 Among the prestigious venues at which NEXUS performed its Rags to Riches program were the University of Toronto Faculty Artist Series (1992), the Percussive Arts Society International Convention in New Orleans (1992), the Jacksonville Symphony Orchestra (1994), the United States Air Force Band in Constitution Hall (1994), the Buffalo Philharmonic Orchestra (1994), the Toledo Symphony Orchestra (1995), the Erie Philharmonic Orchestra (1995), The Flagstaff Symphony (1995), the CBC/Glenn Gould Studio in Toronto (1995), the Windsor (ON) Symphony (1996), the Kitchener/Waterloo Symphony (1996), Wheaton College (1996), the University of Missouri – Kansas City (1997), the Omaha Symphony (1997), the Memphis Symphony (1997), the University of Southern Utah in Logan, UT (1997), the Grand Rapids Symphony (1997), Concordia College in Moorhead, Minnesota (1998), and the University of Oklahoma (1999). From 2000 to 2018, the thousands of small orchestra scores and parts in the Rochester Theatre Orchestra library sat in twelve footlockers and six large cardboard boxes, all resting undisturbed (and unused) on wood-frame shelves in a small room in the basement of my home. 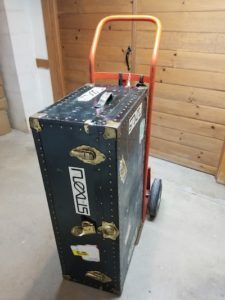 I realized that of the thousands of titles in the library, I had only ever used a virtual handful, and it seemed very unlikely that new opportunities would arise in the foreseeable future to take advantage of the music in the collection, so a decision was made to seek a new home for the RTO library. Inquiries were made to a number of college and public libraries and well as to a handful of performers known to be interested in the music of the early 20th Century, all to no avail. Then on November 6, 2018 out of the blue I received an email from Yurika Kimura indicating that she had heard of a musical organization called the Peacherine Ragtime Society Orchestra, which might have an interest in acquiring the RTO library, so I Googled the name and found the organization’s website [https://peacherineragtime.com]. From the information on the website it was a pleasant surprise to see that the Peacherine Orchestra was presenting concerts incorporating music and silent films that were very similar in nature to the programs I had done with the Rochester Theatre Orchestra and with NEXUS. It appeared to me that this could be an ideal place to relocate the library, and I contacted the group’s founder and conductor, Andrew Greene. Andrew responded virtually immediately expressing his interest in the library, made even more interesting by the fact that the price was right (FREE!). Within a few days Andrew, and Peacherine violist, Colin, made the 6-hour drive from Annapolis, Maryland to my house. 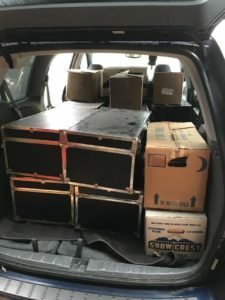 The first real snowfall of the season happened that day, Friday, November 9, as Andrew and Colin excitedly loaded the heavy library footlockers and boxes into their mini-van to start the 6-hour return trip to Maryland with their new acquisitions. The entire library – 12 footlockers and six cardboard boxes in the back of the mini-van, ready to be moved to Maryland. Wishing only the best for Andrew and the Peacherine Ragtime Society Orchestra, nothing would please me more than to know that the music archived in this library will continue to live on, having a renewed life that touches audiences – new and old – with the joyful sounds of the early 1900s.